The showdown between UK Prime Minister Theresa May and the leader of the opposition Labour Party Jeremy Corbyn on the morality, legality and effectiveness of the military strikes led by the US, Britain and France against Syria this week was a reflection of a clash of two visions. The first was the endorsement of the use of crude military power regardless of its legality under the United Nations charter and was argued for by May. The second was for seeking the approval of the UN and abiding by international law even if there was apparent deadlock ahead, as argued for by Corbyn. May won the argument in the UK parliament, making the case for realpolitik in real time and emphasising that she could not have waited for UN approval to respond to what she called “a stain on our humanity” and referring to the alleged chemical weapons attacks on Douma near Damascus. She insisted that the UK had had to act rapidly to prevent more attacks. In defence of her decision to strike alleged Syrian chemical weapons facilities, she warned that waiting for the UN to authorise military action would have effectively given Russia “a veto” on British foreign policy. “The leader of the opposition has said that he can ‘only countenance involvement in Syria if there is UN authority behind it’. The House should be clear that would mean a Russian veto on our foreign policy,” she said. In putting her case in front of British MPs, May accused Moscow of preventing previous UN Security Council Resolutions allowing international inspectors to investigate other alleged chemical weapons attacks in Syria, which she argued meant that the UK and its allies had had no option but to take military action. 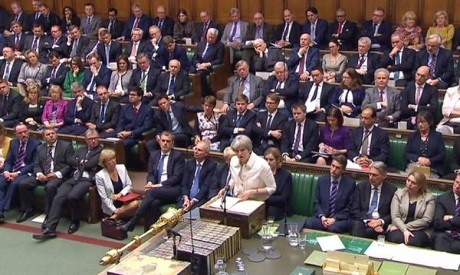 During the six-hour debate in parliament where May answered almost 150 questions, she faced criticisms for launching the air strikes before consulting the legislative body. However, the majority of MPs admitted that they would have approved military strikes against Syria if they had been asked. May replied by suggesting that the “security” of the operation could have been compromised. “This was a limited, targeted strike on a legal basis that has been used before [a humanitarian basis]. And it was a decision that required the evaluation of intelligence and information, much of which was of a nature that could not be shared with parliament,” she said. “The military action was legally questionable. The government’s own justification, which relies heavily on the strongly contested doctrine of humanitarian intervention, does not even meet its own tests. Without UN authority it was again a matter of the US and British governments arrogating to themselves an authority to act unilaterally which they do not possess,” he wrote in an article in the UK Guardian newspaper. “The fact that the prime minister ordered the attacks without seeking authorisation from parliament only underlines the weakness of a government that was in reality simply waiting for authorisation from a bellicose and unstable US president. That’s why we are pressing for parliament to have the final say on planned military action in future in a new war powers act,” Corbyn argued. Although many MPs might agree with Corbyn’s rhetoric, his belief in the UN system and international law left some MPs cold. The UN does not operate in vacuum, and the new cold war between Russia and the West, the deadlock in Syria, and the Russian veto power in the Security Council make the international organisation unable to act when it matters. Although Corbyn’s language could have found support in the UK, May’s action found more, with a UK Sky News TV channel survey showing almost 49 per cent of the British public supported the military strikes in Syria. However, the latest military intervention is unlikely to change much, and the situation is at a deadlock, especially after the advances of Turkish troops in northern Syria and the increased US presence in eastern Syria. The resumption of peace talks is urgent, with the EU leading the calls. In her latest intervention, Federica Mogherini, the EU foreign policy chief, said that the EU “understands” the recent air strikes but demands action on the political front to end the civil war or it could turn into a global conflict. “The European Council understands that the targeted US, French and UK air strikes on chemical weapons facilities in Syria were specific measures having been taken with the sole objective to prevent further use of chemical weapons and chemical substances as weapons by the Syrian regime to kill its own people,” she said. However, “I believe it is evident to all that the only way to put an end to the suffering and the dying of so many Syrians, and the only way to avoid the Syrian crisis further spiralling into a wider regional or global confrontation is to put pressure on the parties and namely on the Syrian regime to come to Geneva with meaningful intentions for negotiations,” she added. Mogherini said the EU member states had shown “full unity” on the issue and called for a summit in Brussels scheduled for next week to be used as a stepping stone to more peace talks. “There was an unequivocal and strong wish from all member states to use the Brussels conference next week as the opportunity to relaunch, together with the United Nations, the political process to solve the Syrian crisis,” Mogherini told reporters in Luxembourg after a meeting mid-week. “Conditions today are not better than last year. Actually, they are deteriorating, and we are seeing more violence and more destruction. We are seeing more people dying, and it is true that the solution to the conflict seems to be more far away than ever in the last seven years of conflict,” she said. Although May’s decision did not cost her politically because the strikes were short and no British or Russian military personal lost their lives, in themselves they changed nothing in the course of the war.